So total only 520. what time will the main event tournament finish? It really depends on the no of entrants. there were 112 entrants and it ended around 4-5 plus in the evening. The estimated time should be around 4-6pm. When is the earliest i can be in Singapore again? Check out the link below and check the time to depart from Leisure World, then another add +1hr 20mins. P/S: If you are taking the last 8.30pm ferry back to Tanah Merah jetty, it will take you back to Habourfont jetty. You definitely can make it to work. and if i dont pay the ferry ticket and cabin (15 October the last date). How much do i need to pay instead? A standard cabin is $80 on weekends. "$42 (ferry ticket) + $60 (ferry cabin) + $400 (tournament fees (main event). So, the total should be SGD502 . One last question. $42 (ferry ticket) this is one way right? So, on Sunday when i go back, i gotta pay $42 again, correct? Thanks. sorry to ask so many questions. No. Payment it's for both ways. You only need to pay $42 that's all. Let me think till tomorrow, then i will register. No problem. You will get to meet many interesting kakis there. Good time for some networking. Yeah.. Thanks for your info. Btw, are you going to participate? 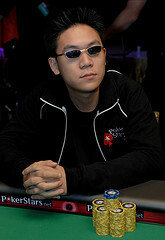 is there any pokerkaki patch for this tournament (like genting) hehe. Yeah definitely, going to be happening, Uncle Bob, Ivan Tan, Bryan Huang. (bueh tahan). I will be there participating as an organiser. I can give you a pokerkaki patch if you turn up for this tourney. Come join in the fun or you gotta regret for LIFE. Just an update for the upcoming tournament. Besides the main event and the 2 side events during the weekend. We will also be offering cash games 24hr round the clock subjected to demand. The stakes offered will be 1/2, 2/5, 5/10. Aside from that, single table Sit n Gos will be run regularly as well, stakes from $100 upwards. I hope that all the Kakis will turn up in force like the last tournament we had, everybody's effort counts towards the development and success of poker in Singapore. So there is no reason not to turn up, do register early with LW for this fantastic weekend ahead. If you guys still have anymore questions he regards to the event. Please do post here and we will respond to your queries asap. For this upcoming tournament, the LW management will be putting up a players party at the Tropicana KTV from 10pm to 12am on Saturday night of the main event. We invite all players and friends to come join us for a get together session. Their will be an Open Bar for 2 hours and light snacks will be served as well. Please do bring along your receipt for the tournament to identify yourselves as from the community. As the free flow and buffet is only for players, family and friends. can I ask is the advance registering for the tourney is closed ? Seems to be locked the post for registering ..
so we have to register ourself at the counter at Tanah Merah ? For all the events ? Main/team and side ? Or will it be onboard, pre-registeration at the counter ? Why is the pre-registration locked? Isn't the cut off supposed to be tonight (15/10) at 2359 hrs? I just called New Century Tours and they infomed that all the cabins are fully booked during the tournament weekend, although registration for the tournament is still open. Seems like this is why the pre-registration is locked. due to overwhelming response to the early birds promotions, the cabins for early birds promotions is fully booked . You may still able to book the cabin under the price of $80 instead of $60(early birds promotions). The early registration is for the discounted cabin only, as for the tournament you can still pre-register here or on site registration subjected to availibility.